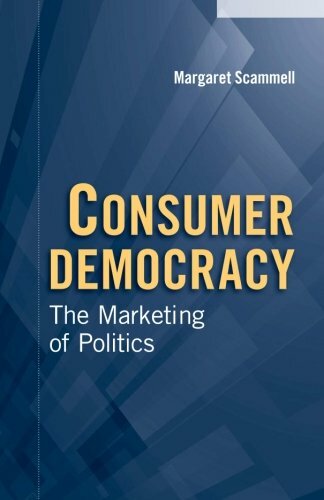 This book argues that marketing is inherent in competitive democracy, explaining how we can make the consumer nature of competitive democracy better and more democratic. Margaret Scammell argues that consumer democracy should not be assumed to be inherently antithetical to 'proper' political discourse and debate about the common good. This book argues that marketing is inherent in competitive democracy, explaining how we can make the consumer nature of competitive democracy better and more democratic. Margaret Scammell argues that consumer democracy should not be assumed to be inherently antithetical to 'proper' political discourse and debate about the common good. Instead, Scammell argues that we should seek to understand it - to create marketing-literate criticism that can distinguish between democratically good and bad campaigns, and between shallow, cynical packaging and campaigns that at least aspire to be responsive, engender citizen participation, and enable accountability. Further, we can take important lessons from commercial marketing: enjoyment matters; what citizens think and feel matters; and, just as in commercial markets, structure is key - the type of political marketing will be affected by the conditions of competition.